The Research Group in Electrocatalysis and Polymer Electrochemistry (GEPE) was formed in 1994 by Prof. J.L. Vazquez and Prof. E. Morallon. At the beginning, the group had only 2 Ph.D. students and all the members were very excited by the challenge of setting in motion a new research project. At present, the Group is ascribed to the Department of Physical Chemistry and also to the Institute of Materials at the University of Alicante (Spain), where fruitful collaboration with other materials science researchers can be done. 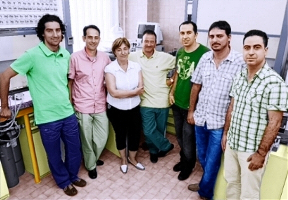 Our current staff is composed by four permanent members from both the University of Alicante and the Polytechnic University of Valencia and a number of Ph.D students, post-doc researchers and visitors. 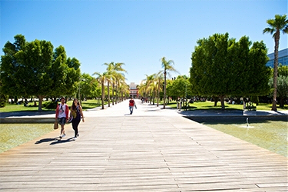 Our research facilities are placed in the Faculty of Sciences at the University of Alicante. We have at around 150 square meters total space divided in three working areas. At the 2nd floor laboratory, Fase-I block, we carry out part of the applied research activities. Most of scientific equipment is placed in the 4th floor laboratory located in Fase-II block, where we perform the fundamental research and also where almost all students work daily. Finally, we also have a pilot plant at our disposal. There we can generate low-scale information about the behavior of the studied system to be used in the design of larger facilities. During the last years, it is noticed that traditional chemistry areas are converging and the boundaries between them are blurring very quickly. Of course, electrochemistry is not indifferent to this collective trend and, particularly, most of our research is performed in close collaboration with scientists coming from other areas of expertise. 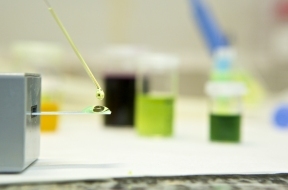 Some years ago, most of our activity focused on the use of electrochemistry for fundamental studies and research but currently we extend our activity to industrial electrochemistry, polymer science, electrochemical energy transformation systems, sensor devices and environmental and bioanalytical applications.